Well Jenny, I had discovered long ago that my husband is very good at untangling things, where I get frustrated. This would be simple for us. He'd untangle while I sang Christmas carols. Of coarse we have been married twenty years so it really wouldn't be a fair test! But I think that your idea is simply ingenious. One suggestion, instead of sending the idea to the congressmen, how about sending it to Pastors, priests, Reverends and Rabbis? It would make their marriage counseling classes so much easier! Jenny I hope you have a wonderful weekend. OMG - that was funny. That is so my hubby and me. We finally chucked the lights 2 years ago and only do pre-lit Christmas trees. Or else we would have been divorced. Or - I would be in prison for manslaughter. But I'd have a good defense, right? 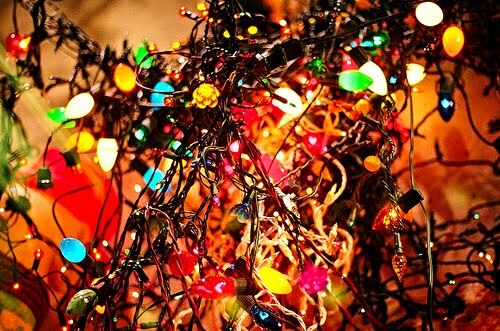 Surely a judge or jury would let me off if they knew it was all due to trying to untangle the freakin' lights. Hahaha! My hubby and I end up hating each other each year after untangling xmas lights, I think that is a normal response. Jenny, this is TOO funny...we now have the "fancy" (they were a buck or 2 at Walmart years ago) light roller things. John always puts the lights on our tree, has for the past 16 years, and I take them down, now, before my roller thing, they would just get in a tote, and some little elf would tangle them sometime during the year. Much happier light hanging with roller thing...by the way I am LOVING my quilt. I have it on my lap as I type! I will be posting a picture of it on my blog this week now that I am finally home. It is wonderful and keeps me warm! thanks again! Ha ha. Early in our marriage I decided to decorate Thanksgiving night and my lights from last year didn't work. My husband drove all over looking for lights. Poor guy. These days I probably would be more laid back about it. Probably. Brilliant! I absolutely love it. hey smart idea girl... any idea how to make a puppy give me some peace through one stinkin night??? I might just lock her up in a room tonight myself!!! Love this Jenny! Of course I could write a book about divorce. But on the lighter side, I used to say I was going to invent clip on lights and lo and behold they came up with prelit trees before I could make my million. Got my first blog post on Southern Baby Biscuits... check me out! LOL! So true ...so true! I also say to test them in a slow slow traffic jam...it's amazing how that can change a personality!